The win for the Belfast club sends them to the top of the Robinson Services Premier League. They are level on points with Waringstown but have a superior run rate. Dougherty top scored with a magnificent 94 off 122 balls – which included eight fours and three sixes. The wicketkeeper batted beautifully and paced his innings nicely during his sides pursuit of 222. He was well supported by his captain, Jones, who finished the match on 86 not out. Jones struck six fours and a maximum during his 111-ball stay at the crease. Opener, John Matchett, edged Matthew McCord behind for five in the third over to leave his side on 13 for one. A second wicket partnership of 154 between Jones and Dougherty all but guaranteed the win. The partnership was eventually broken when Dougherty chipped the ball back to Daniel Poulton for an easy caught and bowled chance. Ryan Hunter joined Jones and added 16 runs as the pair shared a 34-run stand, before Poulton bowled the former to claim his second of the afternoon. This brought Jason van der Merwe to the middle. He hit 16 off 13 balls to see his side over the line. Earlier in the day, Pat Botha – who was back from injury – hit 68 off 78 balls to save his side from a potential slip-up. At 91 for four, a meaningful partnership was required. Alex Haggan joined Botha and the pair added 57 together before Haggan (34) found the hands of Matt McGillivray off the bowling of Jacob Mulder. This gave the spinner his only wicket of the innings. Poulton then arrived and hit 20 in a stand of 47 with Botha before the latter offered a routine caught and bowled opportunity to Allen Coulter. Ryan Eagleson then had to retire hurt after Coulter sent down a delivery that struck the batsman on the hand. There was a brief pause while Eagleson received treatment and eventually it was decided that he would take no further part for the time being. He came back in at the end and was dismissed for four. The pick of the CIYMS bowlers was Coulter, who claimed four for 37 off nine overs. 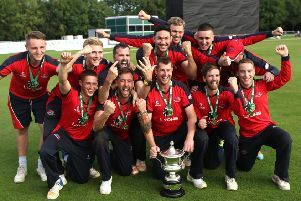 Carrickfergus were awarded six penalty runs due to CIYMS’ slow over-rate. In the end, the six runs didn’t prove costly as the hosts eased over the line with 21 balls to spare. CIYMS will now look ahead to the weekend when they will entertain North Down at home in the league. A win would keep the title race interesting as the top two have started to break away from the others. As for Carrickfergus, they welcome defending champions Waringstown to Middle Road.